The University of New England and Oorala Aboriginal Centre will celebrate NAIDOC Week with a flag-raising ceremony on Monday 6 July 2015. The flag-raising ceremony will be held on the lawns of Booloominbah and will start at 10:30am. 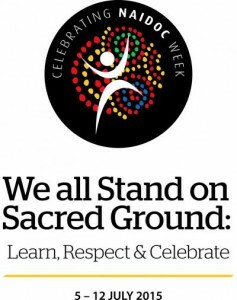 NAIDOC Week is annually celebrated around Australia and the theme of this year’s events, being held from 5-12 July, is ‘We all Stand on Sacred Ground: Learn, Respect & Celebrate’. The flag-raising ceremony has been a key event in UNE’s official calendar for several years and offers opportunity to engage with the local community. NAIDOC Week has historical links to the work of Aboriginal groups who built awareness in the wider community of Aboriginal issues and now celebrates the history, culture, achievements and contributions of Aboriginal and Torres Strait Islander people in Australia. The acronym NAIDOC originally stood for ‘National Aborigines and Islanders Day Observance Committee’. Oorala’s Elder in Residence, Colin Ahoy, will start proceedings by presenting the Welcome to Country. UNE student, Nina Sands, and the Aboriginal Community Liaison Officer from Armidale Dumaresq Council, Cyril Green, will join UNE representatives to speak about the significance of Aboriginal and Torres Strait Islander people’s connection to country. After the Ceremony guests are invited to a light lunch at Oorala – an opportunity for community members to get to know staff and students from our Centre and UNE. Please RSVP to Cassandra Strong at Oorala, UNE, by Monday 29 June (Phone: 02 6773 3121 or Email: cstrong2@une.edu.au).